France promises a “merciless” response to ISIS. What does that mean? 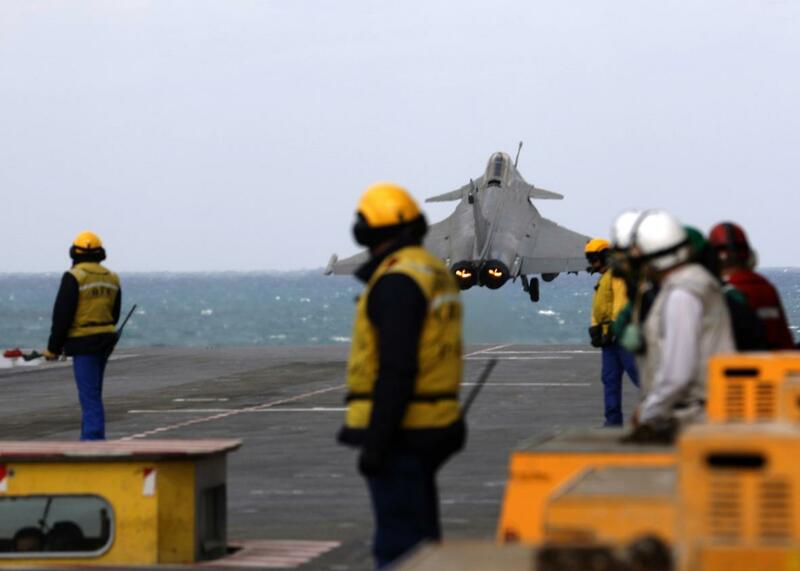 A fligh deck operator leaves the catapult area as a French Navy Rafale fighter jet prepares to take off from the aircraft carrier Charles de Gaulle in the Gulf on Feb. 23, 2015. The extent of the damage caused by Sunday’s French airstrikes in Syria is still unclear. The targets, which French officials say were identified on previous reconnaissance flights and coordinated with the U.S. military, included a command center, a recruitment center, an ammunition storage facility, and a training camp. Activists on the ground say the strikes were “precise and targeted Daesh positions,” using the group’s derogatory Arabic acronym, but ISIS itself claims that the sites were abandoned ahead of time and that there were no casualties. The group also issued a new message warning that countries that take part in U.S.-led airstrikes will share France’s fate. French President François Hollande has promised a “merciless” response to the attacks, which French leaders believe were directly ordered by ISIS commanders in Syria. But it’s still unclear what this means, and whether Sunday night’s attacks were more symbolic or strategic. The French government is certainly going to escalate its role in the fight against ISIS after last week’s events, but it was already one of the most active members of the campaign. It was the first country to join the U.S.-led coalition and has carried out about 1,300 sorties and 271 airstrikes in Iraq. But until recently, France had been reluctant to participate in the campaign on the Syrian side of the border and had been skeptical about the U.S.-led strategy. French leaders had previously worried that strikes in Syria would strengthen Syrian leader Bashar al-Assad. France has been more aggressive than the United States in pushing for punitive measures against Assad’s government: It led the call for airstrikes against his regime following his alleged use of chemical weapons in 2013 and has been aiding anti-Assad rebel groups since 2012. Washington’s U-turn on attacking Assad reportedly led to some skepticism in Paris about U.S. leadership on Syria. But the attacks on Charlie Hebdo in January as well as ISIS’s territorial gains over the course of this year, and a desire not to be sidelined in ongoing international negotiations, changed the thinking in Paris, and in late September, France began targeting ISIS positions in Syria. French jets had struck oil and gas installations near the town of Deis-es-Zor earlier this week and France’s only aircraft carrier had been ordered to deploy to the region before Friday’s attacks.